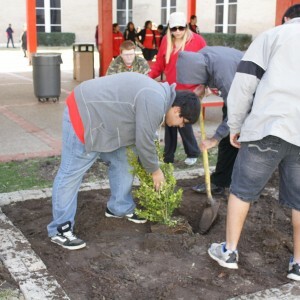 Irving High School will be beautifying their front courtyard garden by planting several flower beds and establishing benches and a picnic table that will be painted, other activities would include cleaning areas in the front courtyard, such as the windows. Austin Middle School an incentive program called ‘Bronco Bucks’. When a student earns a Bronco Buck, they may use it make a reservation for them and a friend to eat in the ‘Bronco Bistro.’ This is a small room across from the cafeteria. The project is to decorate this area and make it more colorful, comfortable and ‘bistro-like.’ With the addition of tall tables, stools, a new lamp along with colorful tables and chairs for the student workers in the bistro. The back wall of the bistro will also be used as an art display. Lively Elementary will be refurnishing the Parent Center area with a rug and the families will create paintings to decorate the school that will include different themes for the families to choose from. The paintings will be displayed all around the school, with a small sign stating the theme Parent Step Ahead and Month of the Family information. WHY: What better way is there than to celebrate “Month of the Family” than by giving back to our schools – the heart of our communities? For the fifth year in a row, Parents Step Ahead and Irving ISD are celebrating March as the “Month of the Family.” PSA and Nissan will be hosting a day of community service by beautifying three Irving ISD campuses to encourage families to be active participants in their schools Nissan employees based in Irving will work alongside local volunteers to demonstrate the company’s commitment to education and their community. By reinforcing family values and unity, we are providing an opportunity during this “Family Day” to strengthen the relationship among families, school and the local community. Parents Step Ahead is a 501(c) (3) nonprofit organization with a mission “to recognize, educate, enable and empower parents to take a proactive role in the educational and personal development of their children.” The organization works in partnership with corporations and community organizations to offer a series of conferences for parents to demonstrate the importance of parental involvement. Programs are free and include dinner, childcare and prizes. www.parentsstepahead.org.